My youngest, Mr. K (3.5) absolutely loves Rescue Bots. For Christmas he received an abundance of Rescue Bots Toys (Optimus Prime Rescue Trailer and many more!) He will talk to anyone and everyone about Boulder, Chase, Heatwave and Blades - and he can go on and on for hours about the transforming vehicles. 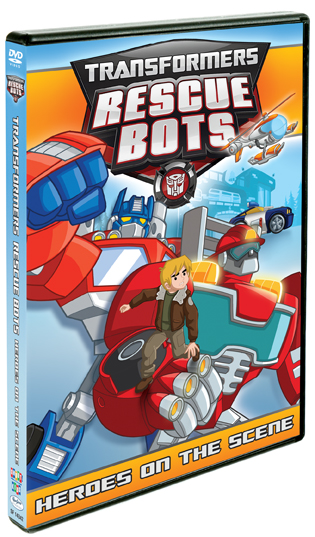 Transformers Rescue Bots: Hereos On The Scene will be available on DVD March 18! We already had Griffin Rock Rescue, so when this one arrived Mr. K was ecstatic, it contains 5 different episodes. He is sick right now, so the arrival came at a great time - lots of rest on the couch with his favourite show playing! TRANSFORMERS RESCUE BOTS: Heroes on the Scene, produced by Hasbro Studios, will be released on DVD March 18th, 2014 by Shout! Factory Kids . Featuring five exciting episodes that the whole family can enjoy, this DVD is priced to own with a suggested retail price of $14.93. In this collection, the Rescue Bots go undercover to protect the quiet little town of Griffin Rock from the green ooze known as the Squilsh, recover treasure stolen by pirates and help Griffin Rock recover from an earthquake! Along with their human friends, the Burns family, the RESCUE BOTShelp keep people safe, and along the way they learn what it really means to be a hero! If you have a preschooler that likes action, then Rescue Bots are sure to be a hit!